I have a passion for living the healthiest, most balanced life I can. No, that does not mean that I am a vegan exercise fanatic who doesn't drink coffee. (I LOVE coffee. And I like to eat bacon sometimes.) What it means is that I strive to do the things that make me feel my best on a regular basis. For me that means sleeping 8 hours most nights of the week, eating clean foods that don’t have long ingredient lists, running more days than I don't, being with my kids and husband more than without, and choosing happiness above all else. The other piece of my life that fuels me is inspiring others to make choices in their days that make their lives better. Helping people make the connections between what contributes to their health and what doesn't is truly amazing. I want to help you live a meaningful and happy life. I graduated with a B.A.SC. in Human Nutrition from the University of Guelph. During my studies I worked as a personal trainer and an aerobics instructor (it WAS the 90’s) and loved helping people improve their fitness and nutrition. After I graduated however, I felt there was a piece of the puzzle missing. It wasn’t until I started to see a Naturopathic Doctor myself that I discovered what that was. I couldn’t help people become their healthiest selves only working on diet and exercise! There was so much more to learn…It was then I decided to further my studies at the Canadian College of Naturopathic Medicine and completed their 4 year post-graduate program in 2006. After passing my board exams, I practiced at a multidisciplinary sports medicine clinic in midtown Toronto for almost 8 years before taking time off to focus on my two girls. It was during that time off that I decided to further my sleep education. I made an even bigger connection between sleep and health when my girls were babies and we were all struggling with sleep. I was amazed at how much all aspects of life improved once they were sleep trained and better rested. It was life changing. I studied with the Family Sleep Institute and became a Certified Child Sleep Consultant so that I could add this expertise to my practice and help other tired families become well rested, happier, and healthier. 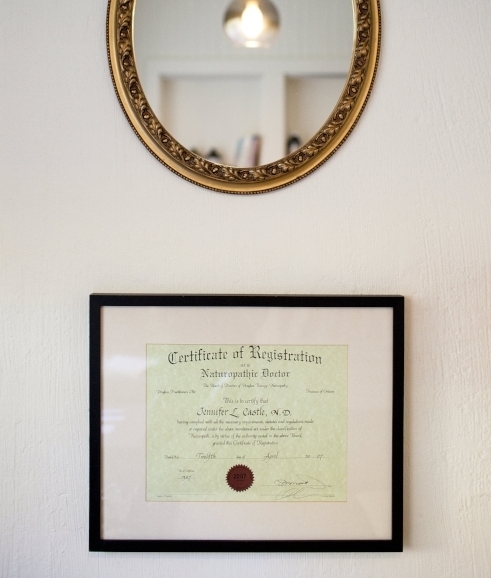 I am licensed Naturopathic Doctor with the College Of Naturopaths of Ontario (CONO) and a current member of both the Ontario Association of Naturopathic Doctors (OAND) and the Canadian Association of Naturopathic Doctors (CAND).